As you are probably already aware, in one of his last acts as London Mayor, Mr Johnson elected not to ratify Merton Council’s unanimous approval for the AFC Wimbledon / Galliard application to redevelop the Plough Lane stadium site. He was advised by the GLA planners that there were “no sound grounds to intervene” but despite this he “called-in” the application for a subsequent hearing. This will take place after the election and will therefore be heard by his successor. Obviously we do not yet know who will win the election on 5th May but it is likely to be either Sadiq Khan of the Labour Party or Zac Goldsmith of the Conservative Party. BTDH is therefore urging as many people as possible, whether Wimbledon fans or not, to write to both leading candidates to remind them of the strength of feeling behind this stadium proposal. The same Mayor who called in this proposal recently approved Tottenham Hotspur’s new stadium plans (which were approved by a majority 8-2 verdict of Haringey council) and presided over an arrangement to allow West Ham use of the Olympic Stadium at very advantageous rates to the club. BTDH is delighted for the supporters of both teams but would hope that all football fans would agree that a small community-owned club with significantly smaller revenue-streams should be treated equally as fairly by the Mayor of London as multi-million pound Premier League entities. We have created a simple form which will automatically email both candidates. 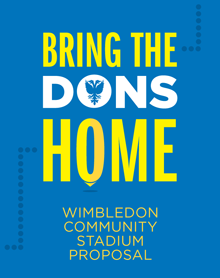 Please also forward this campaign to friends, colleagues and any other football fans or well-wishers across London so Zac Goldsmith and Sadiq Khan are made well aware how many people think that it’s time to Bring The Dons Home. You can read AFC Wimbledon chief executive Erik Samuelson’s appeal for submissions, listen to his recent BBC London interview on the subject and find more information on the planning application, consultations and approvals granted so far in our FAQ. Please ensure you email both candidates and help Bring the Dons Home!